We have just passed the winter solstice, December 21st, the shortest day of the year. Crowds gathered at Stonehenge, a prehistoric monument 25 miles west of Highclere, to welcome the re-birth of the sun as days slowly lengthen again. 5,000 years ago, when Stonehenge was begun, they would perhaps also have gathered to celebrate at the foot of Beacon Hill in the middle of our estate. We certainly have prehistoric barrows built around it. December 25th was later “acquired” by the Romans from earlier communities to worship their God then the Christian Church adopted the date as a point to stop, to reflect, to worship and to rest. I know I do not rest enough and have worked through too many weekends this autumn. Traditionally, we were always supposed to have one day of rest but the problem today, I think, is that that our minds are constantly interrupted by never-ending pings and beeps and fake light. 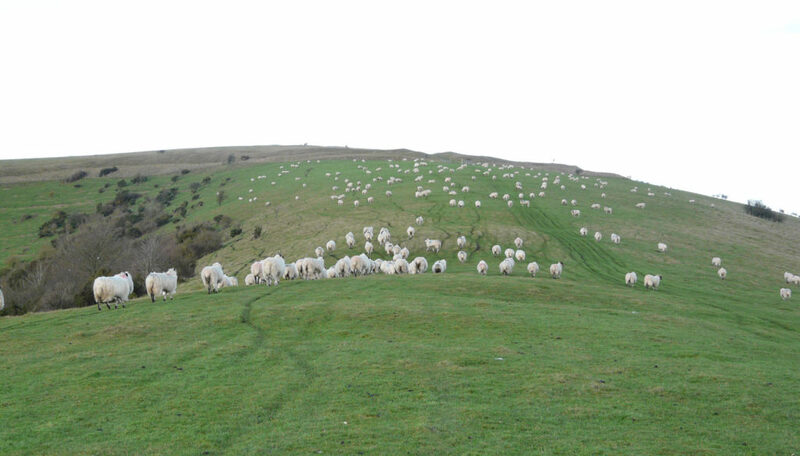 We are lucky here at Highclere as we spend time outside and probably walk our daily quota each day, albeit going round in circles and spending too much looking for someone or something – especially in my case and usually in pursuit of my keys or phone. My husband sighs in despair. 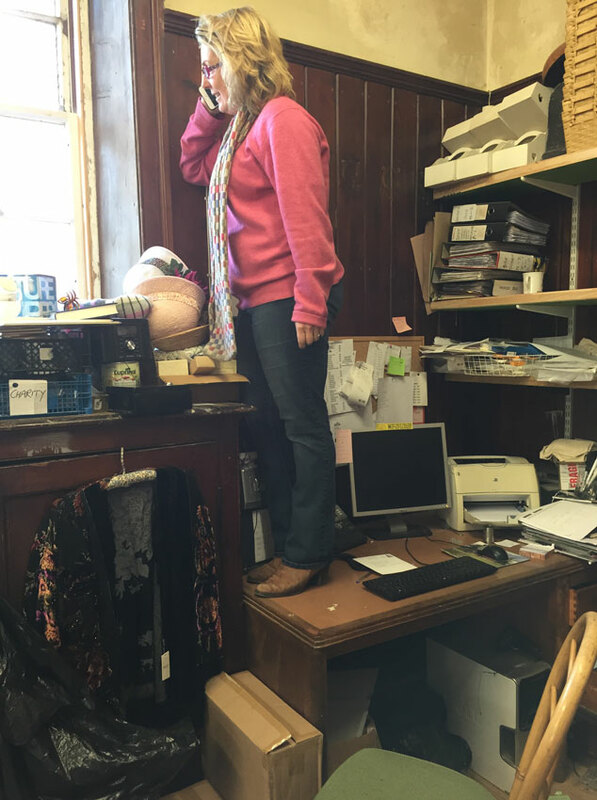 Either that, or I am found clambering on a desk in Sally’s giftshop stock room to lean towards a window for the always elusive phone signal. Good for my balance perhaps. At least each evening I get to enjoy the black stillness when I take the dogs out last thing at night. We are thankfully and gratefully slowing down at Highclere. The office and gardening teams disperse and work on rotas. I am gathering board games, books and quizzes together for the evenings and my nieces are hoping to be led on a pony through the gardens. Looking back at my blogs I thought I might post a few updates. We had a good December week helping charities from Oxfam and Syria to the Air Ambulance, the church and hospitals. As a break, after that last week, I went with my indomitable plane hunting team of Paul and Steve, and found another WW2 plane – in this case a Lysander which we knew had crashed in February 1942. Amazingly we found part of it lying on the surface in a wood gathering moss. 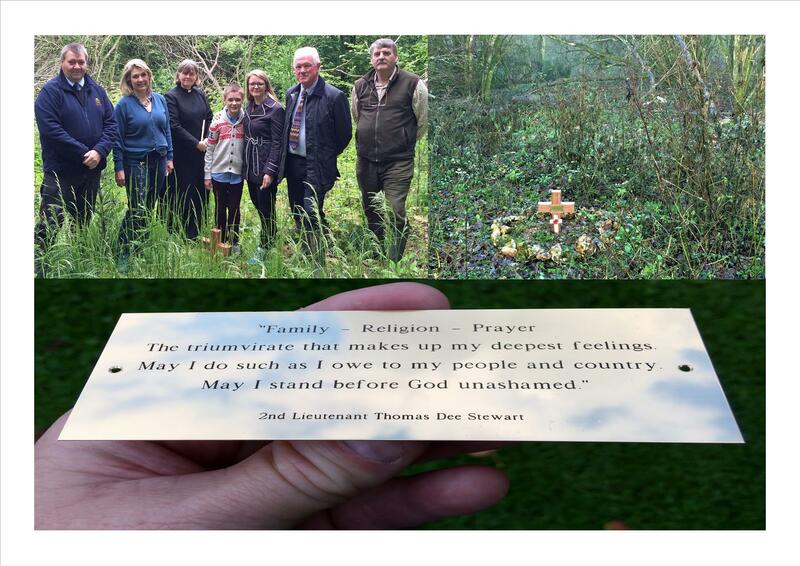 Paul also replaced the cross we had placed to mark where Lt Thomas Stewart had died when the P38 crashed. It is now engraved with his name. His relatives had joined us last summer when we held a short service in a beautiful glade on an English hill. His great niece and her son sang a hymn which moved our small group to tears. More cottages have been refurbished and, at last, the estate office has been completed with the 500 year old beams re-used. Highclere has appeared on a stamp, (1st class of course! ), and we began to work with a champagne house near Épernay in northern France to produce Highclere Champagne. Our “Capability” Brown gardens week was a great success last spring, so this coming May I am going to bring together Jane Austen and Downton Abbey. Literature and landscape – what could be a better combination than Mr Darcy, “Pride and Prejudice”, Downton Abbey and perhaps Alan Titchmarsh… I remain way behind with filing however. Sally is still packing off gift shop items, which means there will be less to count in the New Year. Marvellous. I have, thank goodness, waved my book “At Home” off to the printers. It has taken so many hours that I have utterly failed on the Christmas card front. Maybe it will help bring back some memories of Downton when it is published in the Spring and you can think back to the Dining Room scenes in the show with wonderful menus and stories from weekends past at Highclere. In celebration I thought I would ask some of the extraordinary people with whom I have the honour to work here to come and see the draft and the beautiful photographs in the book – it is after all about a home that they help sustain. They spent the evening arguing over who had worked here the longest – Pat was hoping for the award (60 years) but I think Eddie Hughes has beaten her – just. Don the gardener has only been here 45 years so he has a bit of a way to go yet. I am looking forward to church on Christmas day which, for me, marks the rhythm of the year and underpins the culture and literature I love here. There is going to be something of a crisis however in the evening – no “Downton Abbey” to watch at Downton Abbey this year for the first time in six years! Happy Christmas to you all with all best wishes for 2017. Wow, the tree is gorgeous and it is sitting in an equally gorgeous setting. I love the photo with all the dogs gathered in front of the tree. Merry Christmas and Happy New Year to you and your family. I’ll look forward to seeing the new book. Thank you – I am happy it is finished! Lady Carnavon, I just love these glimpses of everyday life at Highclere that you give us. Such a fascinating life – not too different in some ways from everyone’s life and yet very different in some ways from everyone’s. You seem so good at handling all that has to happen to run such a large place. I love to hear about it. And I appreciate the way you use your exquisite home to help raise money for charity. Keep up the good work. And yes please keep up your blog. It’s an inspiration to others. I also agree that our dogs are like our family! It is so nice to see the day to day life at Highclere. Thanks for sharing, Merry Christmas and all the best in 2017! Such a gift to receive your update on the ‘happenings’ at Highclere this month and the beautiful photos, places I remember during my visit. The highlight of my trip to the U.K. last Fall was a visit to Highclere and my screensaver is a photo of my sister walking up the driveway towards the house. I often leave my computer on during the day because I love that photo so much, such a magnificent building . 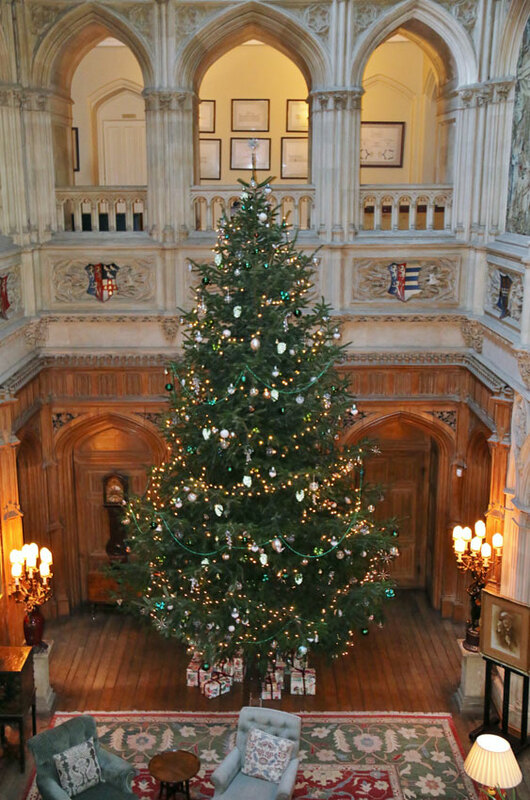 Very best wishes for a wonderful Christmas and a Happy New Year to you, your family and all the staff at Highclere . Good Morning from Muncie, Indiana! I thought about that – no Downton Abbey to watch, but I thought I would go back and watch the final season this weekend! Thank you so much for sharing your beautiful home with us. I look forward to seeing your posts it in my mailbox! Your hard work will help this beautiful residence remain standing for generations to come. Merry Christmas and best wishes for a prosperous new year! Thank you I am so happy it is done and worked with a great publishing team. We will be open @ July 11th to @ September 7th but then we have our Garden Party – 1920’s theme so think third series of Downton Abbey- or watch for the photos if those dates don’t suit! I have loved Highclere since the first tv episode and love it more after we visited the castle in person from Canada; I still look on the visit as the highlight of our trip to the UK. 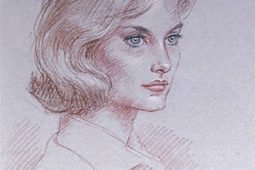 Many many warm Christmas wishes to the family and so happy that you are keeping the Highclere history alive. Merry Christmas from Canada! Thank you – I think it is a good App, we have had good feedback and Jim Carter (aka Carson) is a fantastic narrator for us.He has such a depth and distinctive tone! Wishing you and your family a very Merry Christmas from “across the pond”. Phoenix , Arizona . We won’t be having a white Christmas I’m afraid , we don’t get snow here in Phoenix.. I have enjoyed your blog throughout the year, you are indeed a very busy lady.. The tree looks wonderful and I can imagine the Downton Abbey cast singing around it. Relax, have a glass of sherry, enjoy this season and have a wonderful 2017. Merry Christmas! Happy New Year!! Thanks for blogging about your castle. It is so beautiful. !Merry Christmas to all at Highclere from the USA – North Carolina! Here’s to a wonderful 2017 for us all! As we rush around to finish our preparations for Christmas–we celebrate with the grandchildren Christmas Eve and our daughter’s birthday–it is a treat to read about your preparations. The tree is grand, the dogs looking so regal and well behaved, much like getting 5 rowdy kids to sit still long enough to get a good photo. The castle tree is spectacular, and what I enjoy the most is your charming and witty writing. One my life’s highlights was a visit to Stone Henge June 20th, 2001 while on a tour of England with university students from Colorado. We watched the Druids come in, and now as Browning wrote, Oh to be in England in Spring, I’d love to be in England at Christmas. I’ve enjoyed your posts all year, so thank you for sharing. Merry Christmas and Happy New Year. As I reflect on this writing, I am always amazed at all that you do, are doing or have done in the past year. If, in fact, we do ‘owe a debt to society’, yours has been paid in full many times over. Thank you for sharing your life at Highclere and the community you serve. Merry Christmas and Happy New Year. Thank you but to serve and work is a good way to live – so I am lucky! I thank you from the bottom of my heart for these lovely photos and words. You have such a blessed life, yet you do not forget those of us who may have not been so fortunate. I live in San Diego and have loved England all my life. It is part of my home everyday. Christmas has always been a big part of it too. I made an English Christmas every year. Unfortunately, it is not the same since the loss of my son at age 30 to cancer and following loss of my husband of 36 years to the same. They never got to see Downton Abbey, but would have loved it so. My daughter and I are all that are left now. How we wish we could come and spend some time with you there at Highclare. We would shower you with hugs of gratitude for allowing us into your home and bringing it into ours all these years. Just for a moment it has made us forget our grief and put us in another world. Happy Christmas to you and Lird Carnarvon. May we meet one day….. I thank you from the bottom of my heart for these lovely photos and words. You have such a blessed life, yet you do not forget those of us who may have not been so fortunate. I live in San Diego and have loved England all my life. It is part of my home everyday. Christmas has always been a big part of it too. I made an English Christmas every year. Unfortunately, it is not the same since the loss of my son at age 30 to cancer and following loss of my husband of 36 years to the same. They never got to see Downton Abbey, but would have loved it so. My daughter and I are all that are left now. How we wish we could come and spend some time with you there at Highclare. We would shower you with hugs of gratitude for allowing us into your home and bringing it into ours all these years. Just for a moment it has made us forget our grief and put us in another world. Happy Christmas to you and Lord Carnarvon. May we meet one day….. Wonderful blog, as always. Love all your dogs and am amazed you can assemble them all to stay still for such a wonderful photo! We always look forward to your fascinating views of life at Highclere. A very Merry and Blessed Christmas. It is a high point for us, too, as we think of the Saviour’s birth. And a very Happy New Year to you all. Assembling the dogs was a giggle ! Aww! I absolutely love the picture with the dogs posing. There must have been some magic… used there. 🙂 We only have one dog (a Great Pyrenees) and he’s not very good at it. He always looks away from the camera! And generally wants to do the opposite of what we tell him, lol. Your Christmas tree is just beautiful. I loved looking at all of the pictures and reading your updates. It’s too funny that the gardner has “only” been there 45 years. Looking forward to the new book this spring! Thank you for sharing another glimpse into your life. Sending warm wishes to you, all of your family, and the Highclere family for peace, love, and joy this Christmas, 2016. The tree is spectacular! The Castle is still my favorite part of a trip in 2014. i will never forget the beauty of the castle, the furnishings, and the grounds. I would love to be there at Christmas. The best takeaway from this post for me? A new book! I’ll eagerly await news of publication. Merry Christmas and a Happy, Healthy 2017 to you and Lord Carnarvon! I am so happy the book is away from my desk – it was a huge project! It is in some ways a hymn to Highclere, to the people who work and live here, to the hospitality we seek to offer and to the beauty of it. Thank you – A happy Christmas New Year to you and your family and luckily some friends have just left, leaving behind a bottle of champagne! Dear Lady Carnarvon, once again, I thank you for sharing your day-to-day life experiences and those of so many other good people at Highclere. I spend a bit of time looking for things I put somewhere so as not to be lost! The photos are grand and I am envious of the dogs sitting around the tree!! Happy Christmas to you, Lord Carnarvon, your family and employees. . Thank you for sharing what Highclere looks like during the holiday season; especially meaningful for those of us who have only seen it in the summer months. Looking forward to the Art of Giving event in Napes in February. I trust you will bring some of your books for the event. I am looking forward to the events in Naples as well and have been reflecting on what would amuse you all! It is in a good cause. I am delighted to be asked. Wishing you and your whole family a joyous Christmas and a Happy Healthy New Year. We are ready for Christmas although it’s in the 70’s outside and we haven’t seen snow since, I believe, the 1940’s! But, this is Orlando so the only flurries fly out of machines set up a festival so the Up North Folks can feel at home. I so look forward to your blog. Keep writing and we will all continue to read and enjoy! Thank also for the great photography. Thank you – although my husband is never very happy with my photography! He is much better …. I so much enjoy reading your posts. We were fortunate to visit Highclere in 2014. We actually saw 26 stately homes and Stonehenge while in England. So much fun. Oh my goodness you were busy! Happy New Year! Good morning from San Diego, California! What a lovely story, I love reading them. The tree looks so beautiful and the snow leading to the manor breathtaking. Wishing you, your family and your wonderful staff the Merriest of Christmas’ and a Joyous New Year. Highclere is so beautiful. The pictures probably don’t show how beautiful it really is! Your dogs are all so well behaved in the picture. Just as pretty as yours!! Thank you and happy New Year to you and your dog..
¡Feliz Navidad! Con los mejores deseos desde Sevilla. Thank you from Manitoba, Canada! I enjoy reading your blog and sharing a glimpse of your life there. I, too, look forward to slowing down and having time to contemplate how blessed we are here. Christmas Eve for us is a traditional Anglican service at our little rural chhurch of St. Luke’s. We are looking forward to Christmas morning with our first granchild, Will. He is just 20 months, so Santa will be an important part of the morning! There is a major snow storm forecast for Christmas Day. We are hoping for safe travels for those on the roads and in the air. We are expecting 30 cm over two days and that will be the second time this month! Fortunately, we will stay put although our kids may be flying Boxing Day if they can get off the ground! Merry Christmas to All. And Happy New Year! It never escapes me how integral to life the dogs are, at Highclere Castle; dogs rule! Knowing how hard on things my Mastif is, I cringe thinking of the dogs doing what dogs do, within the walls of Highclere… it almost undoes my nerves to think about! The spaniels are convinced the chairs are theirs – they have a better view higher up and the labradors tend to disappear looking for food.. I normally take in one or two at a time as it is less distracting and they have another room at the back leading to a garden which is fenced, which is practical. I always know I am in for a treat when I see your email in my inbox. Your writing is beautiful. I am so looking forward to your book! Your idea of Jane Austen and Downton Abbey is wonderful. Mentally I am planning a trip to Highclere….now to make it real! A happy New Year anyway! Lady Carnarvon…Thank You for allowing us to come into your beautiful home to see it as the treasure it is…I wait with great anticipation to visit next time I’m in the UK. Happiest of Holidays to you and Lord Carnarvon. A happy New Year to you and your family – where do you live, is it a long way from here? Thank you for sharing your lovely home and for sharing what makes Christmas special for you and your family. Your Christmas Tree is magnificent! Such grandeur! I will miss watching Downton Abbey and seeing your beautiful home each week. Sending Christmas wishes to you and yours from Canada! All the best to everyone at Highclere in 2017. I loved the photos of your home.Your dogs look wonderful,so much a part of the setting of your home. Our dog died three years ago.Your photos gave us the longing to have another dog,although he or she would never replace our dog Teddy. My wife and I would love to visit your home next summer if possible. Best wishes for the present. Wonderful – hope you will make it -and a happy New Year to you both. I can simply get lost in your writings. The photos make me feel a part of the scene. I can feel the love you have for your home in all that you say and do. You are very quick! Evie is on heat! I love your dogs! And I love reading your blogs. Wishing you the best for the holidays! Merry Christmas and Happy New Year! Thank you and a very happy New Year to you! Would love to join in the Jane Austen celebrations.We did visit her home a few years ago and see a beautiful floral display at the Cathedral. Look forward to purchasing your new book. Very hot Christmas tomorrow 35 degrees Celsius. May you all have a peaceful Christmas at Highclere and a joyous 2017. Thank you for the interesting insight into life at the Castle. I am looking forward to Jane Austen too – it is an excuse to re read her books! Wishing all of you at Highclere a very Merry Christmas and the best in the New Year. Your home looks lovely and ready for holiday cheer. Nothing like wonderful dogs and a roaring fire to set the mood! I love Christmas and really looking to Christmas past. In the States Christmas has become under attack since the eighties. Now it’s worse with the political correctness going on here. Though the loosing party didn’t get it between farmers and labor being left behind this attack on our traditions as a society brought a Trump Presidency. Beyond that I love the lights the trees and all that goes with the celebration of the birth of Jesus. 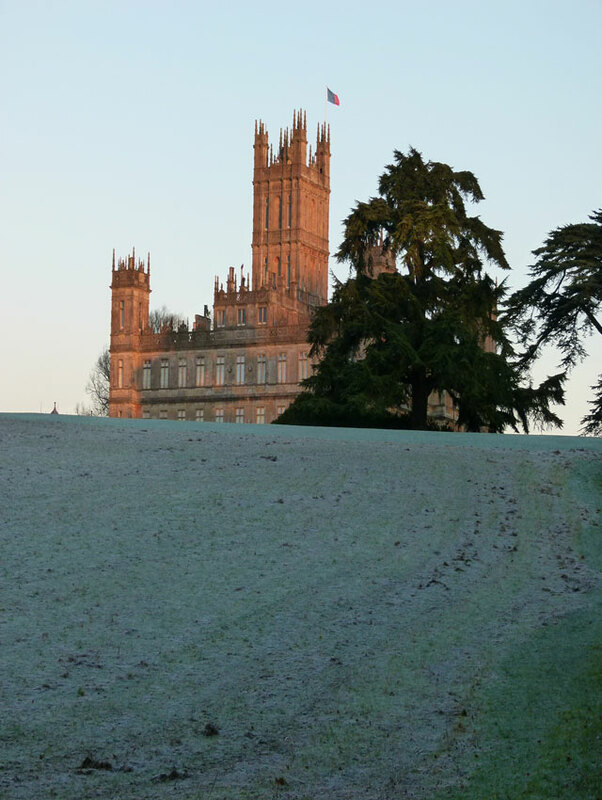 I would love to have a place like Highclere castle to spend Christmas Eve and Day remembering what it’s all about. God Bless andMerry Christmas. Merry Christmas to all of you at Highclere and God bless you and keep in the coming New Year. Will continue to look forward to your wonderful blog. It is the highlight of my day when I can read your latest posts. The castle is so beautifully decorated. I can only imagine how beautiful the other rooms must be! How did you ever get those dogs to sit still?!? I can’t tell you how many blurry shots I have of my dog! They are beuatiful. And such intelligent creatures. Well, except for mine! He was holding the door open when they were passing out the brains! I wish you, your family & staff a wonderful and joyous holiday. And many blessings for the year ahead. You are so kind and they were not going to sit for long! Happy New Year! Wonderful blog as always but your reminder that there is no Downton Abbey to watch come Christmas evening did leave me feeling very sad. While an email alert two days ago from our PBS station told us that there would be a “Call the Midwife” Christmas Special which will air where Downton Abbey use to air that night, somehow it is just not the same. 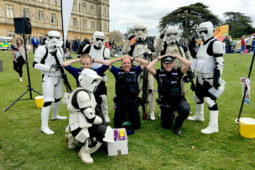 Thanks for keeping us connected to your family and Highclere Castle. It is a definite consolation as is the picture you shared of your seven wonderful dogs! Merry Christmas and a Joyous 2017! We didn’t watch TV at all – Downton Abbey transported us all and a bit of glamour and great lines from Maggie Smith is hard to beat. Thank you for sharing your life with us again this year, and I hope you get as much pleasure from sharing on your blog as we do reading it. Have a very blessed and peaceful Christmas. I am hoping that the joy and gratitude of the season will follow us all into the New Year. Cheers and blessings from Charleston, South Carolina. Thank you for an interesting blog. It’s always excited to follow your news about your life and wonderful estate. What a wonderful Blog again and I am so pleased to hear that you have found another warplane again and could honour the pilot this way ! Your dogs are adorable and yoy do so well with all your responsabilities and trying to keep up with what is going on at Highclere ! The phone-antics are hilarious and thank you for all the photo’s you show us. I have very much enjoyed every blog over this year and look forward to more blogs ! I wish you and all of you at Highclere a very wonderful Christmas and a Happy 2017 from Hertfordshire ! The Lysander was flown by a Canadian who was 31 years old. I think he is buried here in the UK. He was practicing taking out a searchlight (they dropped or retrieved agents behind enemy lines and need little runway) but they were compact tricky planes to fly. So sad. Dear Lady Carnarvon, feeling the black stillness while taking your dog’s out last thing at night is transfixed. I myself felt the exact same thing taking my dogs out. Especially at Christmas, the black stillness is the power of the Christmas spirit, the coming of baby Jesus. The picture of your beloved dogs in the chair in front of the Christmas tree says God seven times. They are the epitome of love and devotion. Merry Christmas to all. 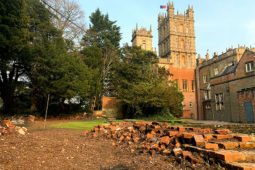 Thank you for maintaining this blog and including such an interesting and informative mix of history, daily life at Highclere and the many worthy causes and groups that you sponsor and assist. And thank you also for sharing such wonderful pictures. To you, your family and all “fellow bloggers”, a very Merry Christmas and a Happy and Healthy New Year. Wonderful – a happy New Year to you and your family! My heart is warmed this Christmas Eve morning as I read about your tribute to the young Lieutenant who died in the WWII plane crash. What a worthy effort. Thank you. Your tree is absolutely lovely and the quietness of that photo belies all the activity you went through to make it all complete. Merry Christmas to you all from the Plains of Kansas. Thank you so much for sharing the wonderful pictures and your Christmas. I was so pleased to see the dogs on the furniture! We have always allowed our lovelies this privilege too. As if we could stop them. In the future, I would love to see a published “coffee table” book if there is not one already. This would be a joy to many, I am sure. Merry Christmas to you and yours and all who keep Highclere going! The best to all in the New Year! Thank you again for a wonderful blog, love the photo of your lovely dogs, I have three, they too are looking forward to Christmas, and seeing what is in their stockings. I am also looking forward to your new book in the Spring. May I wish you, your family, and the dogs, a very Merry Christmas and a Happy New year. I couldn’t let this season go by without thanking you for all the effort you make to send us these e-mails on the coming and going of Highclere Castle. I have enjoyed each and every one of them, as I am sure everyone else has to. Thank you from the bottom of my heart for keeping the Downton Abbey saga still going, and I wish you and your family much needed rest, good health, and a wonderful Christmas and New Year. Your blogs are so inspiring and yet I find a bit of similarity in the “rush” to hurry up and slow down at Christmas…have been doing a bit of that myself. Finally, Christmas Eve is here and at 5:00 p.m. I will take my organ bench for the 31st year as organist at tiny Immanuel Episcopal Church in Ripley, TN, USA…then at 9:00pm my husband and I will transport a wonderful young flautist to a sister church St. Matthew’s Episcopal, Covington, TN where she will present a concert before the 11:00 p.m. “Midnight Mass”…it will be a magical and spiritual occasion! Thank you for all you do to help others along with your husband and those dear people who “sustain” Highclere! Merry Christmas, m’lady! I wish I could play the organ – happy New Year to you and yours! Thank you as always, for your lovely insight into life at Highclere. I was able to visit with the group from Iowa Public Televsion last May and am looking forward to being able to return someday. I was not aware of your search for lost aircraft until this blog, but I have a story to share along those lines. A long time ago in what seems like another lifetime (1980’s) I was a corporate pilot for a company in Birmingham, Alabama, and one of only 4 female full time pilots on the field. My comapany made frequent trips to the Peach Tree Decalb airport outside of Atlanta and I made the acquaintance of the gentleman who owned the fixed base operation we went into. Alas, I am having a senior moment and cannot remember either his name or the FBO name, but his passion was to go to Greenland as part of The Greenland Expidition Society to recover the lost squadron of P38’s that landed on the ice and were abandoned during WWll. I did get to sit in the cockpit of the expidition DC 3, although only on the ground, and he did eventually get to Greenland and find aircraft. However, years of snow and ice had pretty much squashed them flat and I changed jobs and moved so I am not quite sure how the story ended. I think they may have recovered one or part of one airplane, but were generally disappointed with the outcome. I am still in touch with my ex boss and Chief Pilot, so I have a source for the name, but the story works fine either way. Thank you for your concern for familes of the fallen. My parents were both WWii veterans. There is an earlier blog about the P38 which you should be able to find here – I wish to create a memorial here.. Thank you again for sharing your life with all of us. I hope to come visit Highclere one day. 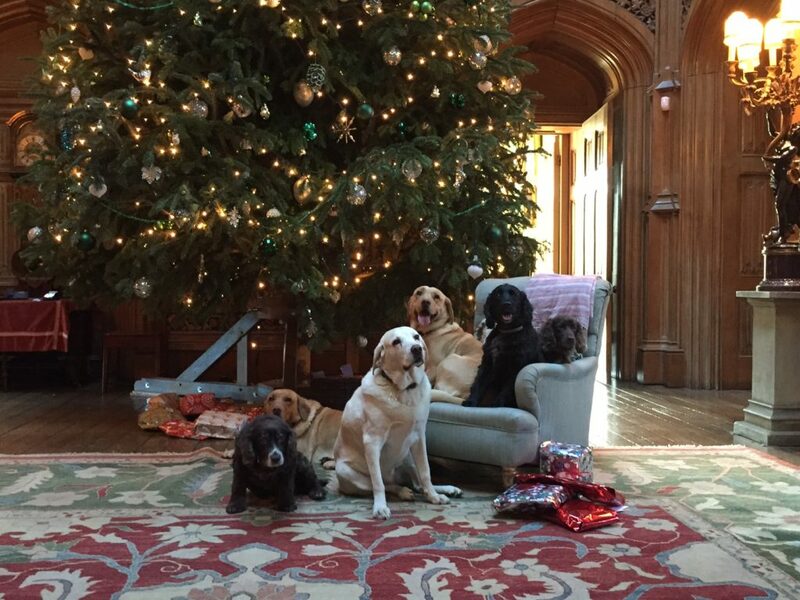 Merry Christmas to you and everyone at Highclere. You bring me great joy. Thank you so much for sharing your wonderful home and so many glimpses of your everyday life and the challenges you have to cope with just as the bright and happy moments. I love your beautiful dogs, we have three of them and we can no longer imagine a life without them. I wish you and all of your loved ones a Merry Christmas and a New Year full of happiness, health and joy. Merry Christmas to you Lady Carnarvon and your lovely dogs too!!! (and your family as well) and a joyous and prosperous New Year to all at Highclere. Your Christmas tree is absolutely gorgeous!!! I enjoyed seeing all 7 of your dogs trying to all share the chair.We here in Peoria, IL we have a Red Heeler (Australian cattle dog )she is 5 years old and we had rescued her from our local animal shelter about two years ago.She is the light of our lives. Like always I enjoy all of your blogs.Although I don’t live in or near the Highclere castle. I always love the pictures you’ve posted on the blogs. We wish for you a happy Christmas and a happy New Year! !! 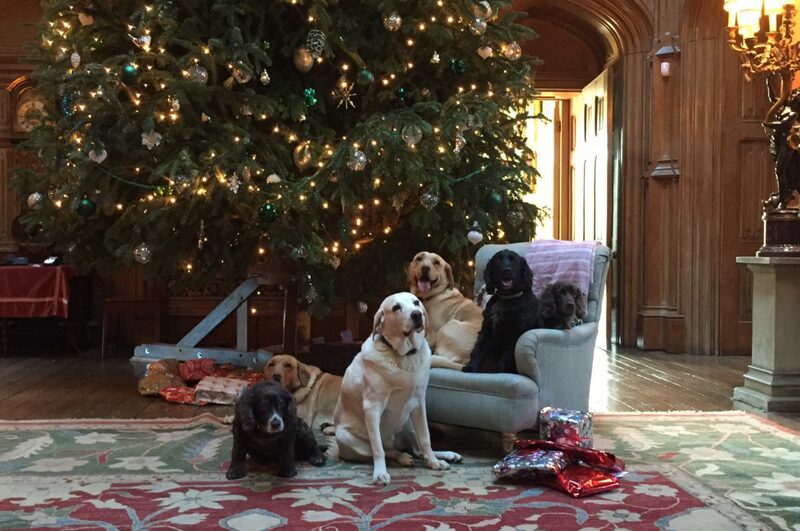 Thank you for such a beautiful description of your Christmas at Highclere! After visiting there in June, and getting much memorabilia from our trip, it was fun to reminisce this Christmas when those gifts were given. What a very beautiful place, one that we hope to revisit at some point. Merry Christmas to all of you! A very happy New Year to you and your family and your dog! I think the best Christmas decorations any house can have are exactly what you have sitting in that chair in front of that beautiful tree. Animals truly add to the spirit of the season. I and my friends had the great joy of attending a tea at Highclere, but the real treat was meeting Alfie…….what a character he was determined to join us while we toured the house. He was eventually persuaded to remain with you only have many pats on the head and scratches under the chin. Much Health and Happiness to your family and all those at Highclere. Hoping your Christmas was joyfully wonderful and may the New Year be as wonderful! I did watch an episode or two over Christmas; I have decided to rewatch the series over the next few months. I always find something new to like about the series and Downton Abbey. I am very excited that we will be in England this summer. I’ll be watching for the opportunity to purchase tickets to visit Highclere while we are there. A very Happy New Year to you. From Spain, Merry Cristmas and a happy New Year to you and tour family. Greetings from Diamondhead, Mississippi, in the USA. My husband and I were lucky enough to visit Highclere Castle in May of 2016; the visit was the highlight of our trip to England, Scotland and Wales. The castle looked just as beautiful as it did in Downton Abbey, which is my favorite English series. I loved the picture of your Christmas tree, and your beloved dogs near the tree. Thank you for writing your blog and allowing us to get a glimpse of daily life at the castle. Have a wonderful 2017. Thank you so much for opening you home to us and sharing your life there. Highclere became a wonderful character itself in “Downton Abbey” and we are all grateful for it. I hope you had a wonderful Christmas. May 2017 bring you much success, and may your family be rewarded with health and happiness. miss your spring opening by one week. from me…..surprised me I don’t do malls) and I surprised her telling her we were going to England and she needed long johns!!! I check the web page everyday hoping you will open up that day for us to visit. I keep praying and hoping. We are going to be open on Saturday March 18th for limited numbers of visitors – will that help? The tree is lovely, as is the room. I also love the way you write about the quiet and dark when you take the dogs out at night. You and those who were there before you must make Highclere a good place to work, or people wouldn’t stay so long! I have just subscribed to your blog after picking up your advert card with my program for The Art of Giving fundraiser here in Naples. I enjoyed your talk very much and hope to one day visit Highclere. The top picture in this blog attracted my attention because of the six dogs there, 4 of them are some kind of spaniel. At first I thought one of them was a Springer Spaniel but seeing the second picture realized that he/she wasn’t. I have a black and white springer girl named Darcie. Each time she heard the Downton theme, she would run up to the TV to try to get at Isis. I think that when she sees animals on television, she thinks they are trying to get into her house. Thanks again for opening your home to visitors. It is a marvelous place. Wishing you a wonderful Spring. Thank you for your kind comments – they are working cocker spaniels – I am missing one the youngest who is dark brown, Evie, in the photo. I think she was in season then. Spaniels are all so optimistic about life! Every day is a new adventure places to go and people to meet. Having discovered your blog by accident, more or less, I just subscribed…..if for no other reason than (and after having glanced through a few entries) my having thought “What an remarkably kind woman….”. I’d like to hear more about what you’re doing and thinking. So, I’ll be following your blog. Take a compliment from a complete stranger on another continent (North America, in my case)……from your writings, you seem to be (when you could be quite otherwise, of course) extraordinarily engaged with “the world outside” and others. Some folks seem to just have a gift for living a purposeful life and sharing that with others. My impression is that you’re among those.